I started when I was 10, so about 5 years. Probably Bethany Hamilton because of her determination and bravery. Fistral when it’s not too busy, or Penhale corner. I think that it’s quite laid back and chilled out, especially when I’m just free surfing. Being picked to be on the British team. I surf as often as I can and go to the gym to keep fit. Definitely my latest trip to Costa Rica, with beautiful warm waves and fantastic beaches. Mostly just J.cole and Chance The Rapper haha! One of my first ever contests I dropped in, in the final. I couldn’t pick just one, I had many great ones in Costa Rica and recently surfed a few bigger waves at Milook Reef. The one I ride most is a 5’7″ custom board shaped by Phil Hodge. 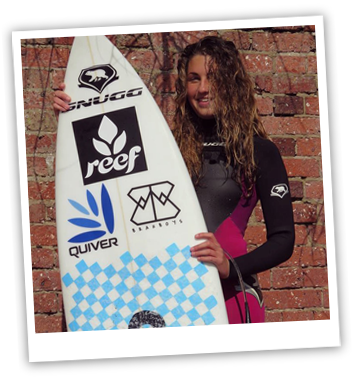 Make sure you get the board right for your ability as you’ll have more fun and find it easier, Quiver have a great range!